We are pleased to offer used golf carts for sale. These carts are typically Club Cars and EZ-GO, two of the premier lines of golf carts. They are generally four to six years old and will be in good to excellent operating condition. We have taken the liberty to customize a few as they come in and will be willing to work with you to customize a cart to your preferences. Our inventory is changing regularly and we try to keep up to date with the inventory on our website. 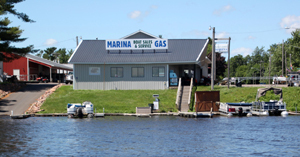 If you don't see what you are looking for, please give us a call. The Club Car Precedent series is one of the industry's premier golf carts on the course or through the streets. This used golf cart is in excellent condition with many add-on options and definitely one to brighten up any neighborhood or campground. It comes with a 48v electric motor, 6' risers and a flip-down rear seat. This unit will sell quickly at $4295.00. The EZ-GO cart is another of the industry's premier golf carts on the course or through the streets. 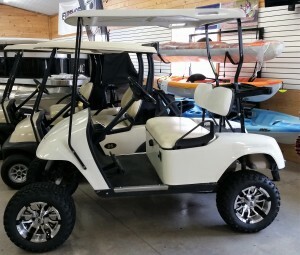 This used golf cart is in excellent condition with many add-on options and definitely one to brighten up any neighborhood or campground. It comes with a 4-Stroke gas motor and 6' risers. This unit will is priced at $4395.00.